The Belgian national football team[C] has officially represented Belgium in association football since their maiden match in 1904. The squad is under the global jurisdiction of FIFA and is governed in Europe by UEFA—both of which were co-founded by the Belgian team's supervising body, the Royal Belgian Football Association (RBFA). Periods of regular Belgian representation at the highest international level, from 1920 to 1938, from 1982 to 2002 and again from 2014 onwards, have alternated with mostly unsuccessful qualification rounds. Most of Belgium's home matches are played at the King Baudouin Stadium in Brussels. On 11 October 1900, Beerschot AC honorary president Jorge Díaz announced that Antwerp would host a series of challenge matches between Europe's best football teams. After some organisational problems, on 28 April 1901, Beerschot's pitch hosted its first tournament, in which a Belgian A-squad and a Dutch B-team contested the Coupe Vanden Abeele. Belgium won, and beat the Netherlands in all three follow-up matches; FIFA does not recognise these results because Belgium fielded some English players. On 1 May 1904, the Belgians played their first official match, against France at the Stade du Vivier d'Oie in Uccle; their draw left the Évence Coppée Trophy unclaimed. Twenty days later, the football boards of both countries were among the seven FIFA founders. At that time, the Belgian squad was chosen by a committee drawn from the country's six or seven major clubs. In 1906, the national team players received the nickname Red Devils because of their red jerseys, and four years later, Scottish ex-footballer William Maxwell replaced the UBSSA committee as their manager. From 1912, UBSSA governed football only and was renamed UBSFA. 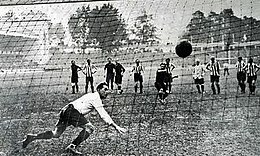 [D] During the Great War, the national team only played unrecognised friendlies, with matches in and against France. At the 1920 Summer Olympics, in their first official Olympic appearance, the Red Devils won the gold medal on home soil after a controversial final in which their Czechoslovak opponents left the pitch. In the three 1920s Summer Olympics, they achieved fair results (four wins in seven matches), and played their first intercontinental match, against Argentina. However, over the following decade, Belgium lost all of their matches at the first three FIFA World Cup final tournaments. According to historian Richard Henshaw, "[t]he growth of [football] in Scandinavia, Central Europe, and South America left Belgium far behind". Although World War II hindered international football events in the 1940s, the Belgian team remained active with unofficial matches against squads of other allied nations. Belgium qualified for only one of eight major tournaments during the 1950s and the 1960s: the 1954 World Cup. The day before the tournament began, the RBFA was among the three UEFA founders. Dutch journalists considered the draw of the 1954 Belgian team in their opener against England to be the most surprising result of that match day, even more than Switzerland's victory over the Italian "football stars". However, Belgium were eliminated after a loss to Italy in the second (and last) group match. Two bright spots in these decades were wins against World Cup holders: West Germany in 1954, and Brazil in 1963. Between these, Belgium defeated Hungary's Golden Team in 1956. The combination of failure in competitive matches, and success in exhibition matches, gave the Belgians the mock title of "world champion of the friendlies". The team's performance improved during the early 1970s, under manager Raymond Goethals. Fully dressed in white, as the White Devils, Belgium had their first victories at World and European Championships at the 1970 World Cup and Euro 1972. En route to that Euro appearance, their first, they eliminated reigning European champions Italy by winning the two-legged quarter-final on aggregate. At the end stage, they finished third by winning the consolation match against Hungary. In 1973, the denial of a match-winning goal in their last 1974 FIFA World Cup qualification match for UEFA Group 3 cost Belgium their appearance at the finals, causing Belgium to become the only nation ever to miss a World Cup final round despite not allowing a goal during the qualifiers. The next two attempts to reach a major finals were also fruitless. Beginning with a second-place finish at Euro 1980, the 1980s and the early 1990s are generally considered as Belgium's first golden age. Coached by Guy Thys, they achieved their spot in the 1980 final with an unbeaten record in the group phase; in the final, they narrowly lost the title to West Germany with the score 1–2. Starting with the 1982 World Cup, and ending with the 2002 World Cup, the national team qualified for six consecutive World Cup end stages and mostly progressed to the second round. During this period, managers Guy Thys, Paul Van Himst and Robert Waseige each guided a Belgian selection past the first round. In addition to receiving individual FIFA recognitions, the team reached the semi-finals of the 1986 World Cup. After reaching the Euro 1980 final, they were unsuccessful at subsequent European Championships, with early exits from their appearances in 1984 and in 2000. During the late 1990s, they played three friendly tournaments in Morocco, Cyprus and Japan, sharing the 1999 Kirin Cup with Peru in the latter. The greatest talents of the Belgian team during this golden age were retired from international football by 2000. During the World Cup in 2002, Belgium defeated Russia and tied with co-hosts Japan and Tunisia to reach the round of 16. Belgium (in red) playing Algeria at the Mineirão at the 2014 World Cup. After two matches as interim coach, Wilmots agreed to replace Leekens as manager. Following his appointment, the team's results improved, such that some foreign media regarded it as another Belgian golden generation. The young Belgian squad qualified as unbeaten group winners for the 2014 World Cup finals, and earned Belgium's second-ever place in a World Cup quarter-finals with a four-match winning streak. Belgium qualified for Euro 2016 with a match to spare in October 2015, and took the top spot in the FIFA World Rankings for the first time in November 2015, to stay first for five months. In the following year, Belgium could not confirm their role as outsider at the European Championship with a quarter-final elimination by the 26th FIFA-ranked Welsh team. This prompted the RBFA to dismiss Wilmots. In the 2018 World Cup qualifying allocation, they were seeded first in their group, and made the final tournament under Spanish manager Roberto Martínez, becoming the first European team besides hosts Russia to do so. The team reached an all-time high third place in the World Football Elo Ratings after their win in the round of 16. Belgium was eliminated in the semi-finals by eventual champions France, but won the third place play-off against England. For their first unofficial match in 1901, the Belgian team wore white jerseys with tricoloured bands on the upper arms. Around their third unofficial match in 1902, the choice was made for a "shirt with national colours ... [that would indicate,] with a stripe, the number of times every player has participated in an encounter". Since 1904, Belgium's classic all-red jersey design has been altered twice. In 1904–05, the squad briefly wore satin shirts with three horizontal bands in red, yellow and black; according to sports journalist Victor Boin, the shirts set "the ugliness record". During the 1970s, manager Raymond Goethals chose an all-white combination to improve the team's visibility during evening matches. In 1905, a Dutch journalist wrote a post-match report that described three Belgian footballers to "work as devils". A year later, inspired by Belgium's red-coloured jerseys and three successive victories, Léopold FC manager Pierre Walckiers nicknamed the Belgian players "Red Devils". Because of the white home shirts Belgium wore in the 1970s, they were temporarily known as the White Devils. Numerous former and current venues in 11 urban areas have hosted Belgium's home matches. Most of these matches have been played in Brussels at the Heysel Plateau, on the site of the present-day King Baudouin Stadium—a multipurpose facility with a seating capacity of 50,122. Its field also hosts the team's final trainings before domestic matches. Since 2007, most physical preparation takes place at the National Football Centre in Tubize, or at Anderlecht's training ground in the Neerpede quarter. Apart from Belgian home friendlies, at the international level Belgium's national stadium has also hosted six European Championship matches. 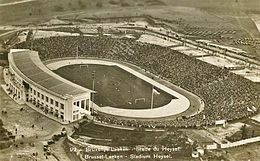 In 1930, for the country's centennial, the venue was inaugurated as the Jubilee Stadium with an unofficial match between Belgium and the Netherlands. At that time, the stadium had a capacity of 75,000. In 1946, it was renamed Heysel Stadium after its city quarter. This new name became associated with the tragedy preceding the 1985 European Cup final between Juventus and Liverpool; 39 spectators died after riots in the then antiquated building. Three years after the disaster, plans were unveiled for a renovation; in 1995, after two years of work, the modernised stadium was named after the late King Baudouin. In May 2013, the Brussels-Capital Region announced that the King Baudouin Stadium would be replaced by Eurostadium, elsewhere on the Heysel Plateau; in 2018, however, the plans for the new stadium were cancelled definitively. 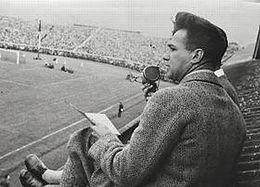 The first live coverage of a Belgian sporting event occurred on 3 May 1931, when journalist Gust De Muynck commentated on the football match between Belgium and the Netherlands on radio. Later, football broadcasts were also televised. As 60 per cent of Belgians speak Dutch and 40 per cent French, commentaries for the national team matches are provided in both languages. The matches are not broadcast in German—Belgium's third official language. During Belgium's tournament appearances in the 1980s and the early 1990s, Rik De Saedeleer crowned himself the nation's most famous football commentator with his emotional and humorous reports. Initially the matches were transmitted mainly on public television channels: the former BRTN in Dutch, and the RTBF in French. Since 1994, commercial channels such as vtm and its sister channel Kanaal 2, and VIER in Flanders, have purchased broadcasting rights. As of May 2018, the Euro 2016 round-of-16 match against Hungary was the most-watched programme in Belgian television history, with an audience of over four million viewers out of 11.3 million Belgian citizens. 2 weeks before 2018 FIFA World Cup, all international fixtures featuring Belgium are currently broadcast by VTM (in Dutch), RTBF and RTL Group (both in French) until 2022. Multiple events were organised for the fans during the squad's peak popularity in the 2010s. During the 2014 World Cup qualifiers, a string of interactive events called the Devil Challenges were organised. 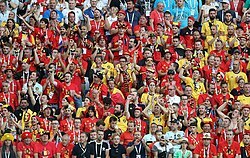 The premise was that small groups of international players would do a favour in return for each of the five comprehensive chores their supporters completed ("colour Belgium red", "gather 500,000 decibels", etc. ), all of which were accomplished. In June 2013, the Belgian national team's first ever Fan Day attracted over 20,000 supporters; a second was held after the 2014 World Cup. On the days of Belgium's 2014 World Cup group matches, large dance events titled Dance with the Devils took place in three Belgian cities. This type of happening was repeated during Belgium's Euro 2016 group matches. Occasionally, the Belgian team directly supported charity. Between 1914 and 1941 they played at minimum five unofficial matches of which the returns were for charitable purposes: two against France, and three against the Netherlands. In mid-1986, when the Belgian delegation reached the Mexico World Cup semi-finals, the squad started a project titled Casa Hogar, an idea of delegation leader Michel D'Hooghe. Casa Hogar is a home for street children in the Mexican industrial city of Toluca, to which the footballers donated part of their tournament bonuses. In August 2013, the national team supported four social projects through the charity fund Football+ Foundation, by playing an A-match with a plus sign on the shoulders of their jerseys and auctioning the shirts. In the 21st century, several national team players acted up against discrimination. In 2002, the national squad held its first anti-racism campaign in which they posed with slogans. A home Euro 2012 qualifier was given the theme of respect for diversity in 2010; this UEFA-supported action was part of the European FARE Action Week. Ex-Red Devil Dimitri Mbuyu—the first black Belgium player (in 1987)—was engaged as godfather, and other foreign, current, and former footballers who played in the Belgian top division participated. In 2018, four national team players spoke up against homophobic violence, in a video clip made by organisation Kick It Out. Since 2012, the team logo is a red trident (or three-pronged pitchfork), an item that is often associated with the devil. Apart from that, the national squad has also had four official anthropomorphous mascots. The first was a lion in team kit named Diabolix, a reference to the central symbol in the Belgian coat of arms that appeared on the team jerseys from 1905 to 1980. In accordance with their epithet, the next mascots were a red super-devil and two fan-made modern devils; the most recent one, since 2018, was named "Red". The team's deterioration after the 2002 World Cup lead to their absence from the end stages of the next five major tournaments, and strained their popularity. Between 2004 and 2010, local journalists called the Belgian footballing nation "mortally ill". Of the fans that kept supporting their squad in bad times, Ludo Rollenberg was one of the most loyal. He attended the team's matches worldwide since 1990, missing only the 1999 Japanese Kirin Cup and two other matches by 2006, and was the only supporter to attend their matches in Armenia in 2009. Belgium's main football rivals are its neighbours the Netherlands and France, with which it shares close cultural and political relations. The matchup between the Belgian and Dutch team is known as the Low Countries derby, as of May 2018[update] they have played each other in 126 official matches. Belgium won the first four—unofficial—matches against the Netherlands, but lost their first FIFA-recognised contest. The two national teams played each other biannually between 1905 and 1964, except during the World Wars. They have met 18 times in major tournament campaigns, and have played at least 35 friendly cup matches: in Belgium for the Coupe Vanden Abeele, and in the Netherlands for the Rotterdamsch Nieuwsblad-Beker. The overall balance favours the Netherlands, with 55 wins against 41 Belgian victories. The Low Countries' squads co-operated in fundraising initiatives between 1925 and 1941; they played five unofficial matches for charity, FIFA and the Belgian Olympic Committee. The clash between the Belgian and French sides is nicknamed le Match Sympathique in French ("the Friendly Match"); they have contested 73 official matches as of May 2018[update]. 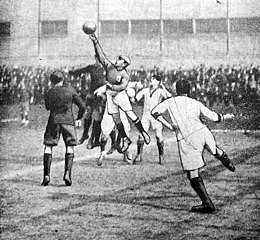 The first match between Belgium and France, the Évence Coppée Trophy played in 1904, was the first official match for both teams and the first official football match between independent countries on the European continent. Until 1967, the sides met almost annually. As of May 2018, France has played most often against Belgium in international football. Belgium have the better record, with 30 wins to France's 25. However, France has two World Cups and have defeated the Belgians in all three World Cup encounters. Since 1904, the RBFA, 24 permanent managers and two caretaker managers have officially been in charge of the national team;[G] this includes one national footballer selector. As of May 2018[update], a crew of over 20 RBFA employees guides the player group, including their Spanish manager Roberto Martínez, his assistants Graeme Jones and Thierry Henry, and goalkeeping coaches Erwin Lemmens and Iñaki Bergara. As of 6 July 2018, Martínez is statistically the best performing Belgium manager with an average of 2.46 points per match. [H] Under Marc Wilmots, Belgium reached the top FIFA ranking spot in 2015, which earned him the title of Best Coach of the Year at the 2015 Globe Soccer Awards. Under Guy Thys, the squad achieved record results at World and European championships; World Soccer magazine accordingly proclaimed him Manager of the Year in 1986. Rather than developing innovative team formations or styles of play, Belgium's managers applied conventional tactics. At the three 1930s World Cups, the Red Devils were aligned in a contemporary 2–3–5 "pyramid". In 1954, Doug Livingstone's squad played in a 3–2–5 "WM" arrangement during World Cup matches. Throughout most of their tournament matches in the 1970s, the 1980s and the 1990s, the team played in a 4–4–2 formation. Since Raymond Goethals' stint in the 1970s, a key strength of the Belgian squad has been their systematic use of the offside trap, a defensive tactic that was already intensively applied in the 1960s by Anderlecht coach Pierre Sinibaldi. According to football journalist Wim De Bock, "master tactician" Goethals represented the "conservative, defensive football of the Belgian national team"; he added that in the 1970s, the contrast between the Belgian playing style and the Total Football of their Dutch rivals "could not be bigger". In an attempt to win a match at the 1998 World Cup, Georges Leekens chose a 4–3–3 arrangement for Belgium's second and third group matches. Robert Waseige, Belgium coach around 2000, said that "above all, [his] 4–4–2 system [was] holy", in the sense that he left good attackers on the bench to keep his favourite formation. Wilmots opted for the 4–3–3 line-up again, with the intention of showing dominant football against any country. The following 28 players were called up for the UEFA Euro 2020 qualifying matches against Russia and Cyprus on 21 and 24 March 2019, respectively. On 18 March both Thomas Meunier and Mousa Dembélé dropped out due to injury. Roberto Martinez confirmed on 20 March that Romelu Lukaku was unavailable for the match against Russia due to injury, but might be fit for the game against Cyprus and thus remained with the squad , however two days after the match against Russia it became clear that he would not be able to play, with also Dedryck Boyata (personal reasons) and Matz Sels (shoulder injury) dropping out. Caps, goals and player numbers are correct as of 24 March 2019[update] after the match against Cyprus. Between 1904 and 1980, mainly attacking Belgium players were recognised as talented footballers. In the team's first decade, striker Robert De Veen was very productive with 26 goals in 23 international appearances. Richard Henshaw described Alphonse Six as "Belgium's greatest player in the prewar period ... [who] was often called the most skillful forward outside Great Britain". The key player of the victorious 1920 Olympic squad was Robert Coppée, who scored a hat-trick against Spain's Ricardo Zamora, and the penalty in the final. Other outstanding Belgian strikers in the interwar period were former top scorer Bernard Voorhoof and "Belgium's football grandmaster" Raymond Braine, considered "one of the greatest players of the era". Gifted players in the 1940s and the 1950s included centre-back Louis Carré and attackers Jef Mermans, Pol Anoul and Rik Coppens; at the 1954 World Cup, Anoul shone with three goals, and newspaper L'Équipe named Coppens the event's best centre forward. 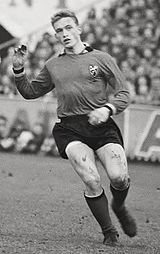 The 1960s and the early 1970s were the glory days of forward and four-time Belgian Golden Shoe Paul Van Himst, later elected Belgian UEFA Golden Player of 1954–2003 and Belgium's Player of the Century by IFFHS. At the 1965 Ballon d'Or, Van Himst ranked fourth, achieving Belgium's highest ever position at the European football election. Decades after Coppens and Van Himst had retired from playing football, a journalist on a Flemish television show asked them "Who [from both of you] was the best, actually?". Coppens replied: "I will ask Paul that ... If Paul says it was me, then he's right". In 1966, striker Raoul Lambert and defending midfielder Wilfried Van Moer joined the national team; while the UEFA praised Lambert for his skills at Euro 1972, Van Moer won three Golden Shoes and equalled Van Himst's fourth rank at the 1980 Ballon d'Or. During the 12 years in which Belgium failed to qualify for major tournaments, another golden generation matured, most of whom later featured in foreign top football leagues; as of July 2013, 12 Belgian national team players would play the next season in the English Premier League. Five players of this generation gained both prime individual and team awards in foreign top competitions or European club competitions:[I] defenders Vincent Kompany and Jan Vertonghen, wingers Eden Hazard and Kevin De Bruyne, and forward Kevin Mirallas. Belgium failed to progress past the first round of their earliest five World Cup participations. After two scoreless defeats at the inaugural World Cup in 1930, the team scored in their first-round knockout matches in the 1934 and 1938 editions—but only enough to save their honour. In 1954, they tied with England (4–4 after extra time), and in 1970, they won their first World Cup match, against El Salvador (3–0). From 1982 until 2002, Belgium qualified for six successive World Cups, and in the tournament finals they advanced beyond the first round five times. In the 1982 FIFA World Cup opener, Belgium beat defending champions Argentina 1–0. Their tournament ended in the second group stage, after a Polish hat-trick by Zbigniew Boniek and a 0–1 loss against the Soviet Union. At Mexico 1986, the Belgian team achieved their then best-ever World Cup run at the time. In the knockout phase as underdogs they beat the Soviets after extra time (3–4); the unnoticed offside position of Jan Ceulemans, during the initial ninety minutes, allowed him to equalise (2–2) and force the match into extra time. They also beat Spain, in a penalty shoot-out after a 1–1 draw, but lost to eventual champions Argentina in the semi-final 2–0, and France in the third-place match (4–2). In the 1990 FIFA World Cup, Belgium dominated periods of their second-round match against England; Enzo Scifo and Jan Ceulemans hit the woodwork. David Platt's volley in the final minute of extra time, described as "nearly blind" by Richard Witzig, avoided an apparently goalless draw and led to the sudden elimination of the Belgians. In 1994, a 3–2 defeat to defending champions Germany saw Belgium go out in the second round again. Afterwards, the entire Belgian delegation criticised referee Kurt Röthlisberger for not awarding a penalty for a foul on Belgian Josip Weber. Three draws in the group stage of the 1998 World Cup were insufficient for Belgium to reach the knockout stage. With two draws, the 2002 FIFA World Cup started poorly for Belgium, but they won the decisive group match against Russia 3–2. In the second round, they faced eventual World Cup winners Brazil; Belgium lost 2–0 after Marc Wilmots' headed opening goal was disallowed due to a "phantom foul" on Roque Júnior, as Witzig named it. In 2014, Belgium beat all their group opponents with a single-goal difference. Thereafter, they played an entertaining round of 16 match against the United States, in which American goalkeeper Tim Howard made 15 saves. [J] However, they defeated the United States 2–1 in extra time. In a balanced quarter-final, Argentina eliminated Belgium, after a 1–0 victory. At the 2018 World Cup, Belgium started with five consecutive victories (including group wins over Panama, Tunisia and England). In the fourth, in the round of 16 match against Japan, they suffered a major setback in the second half by being led 0–2, but goals from Jan Vertonghen and late substitutes Marouane Fellaini and Nacer Chadli led to an unlikely and historical comeback to 3–2. Belgium then defeated World Cup favourites Brazil 2–1 on the back of an early Fernandinho own goal and a goal by Kevin De Bruyne, so Belgium reached the semifinals. Belgium dominated the game but lost to France 0-1, on one of France's rare chances, in the Semi-Final thus losing the chance to play in the final of the FIFA 2018 World Cup. They rebounded to win 2-0 in their second victory over England in the tournament to secure third place and the best ever World Cup result for the Belgian national team. With four successful qualification campaigns out of thirteen, Belgium's performance in the European Championship does not compare to their World Cup record. Belgium has hosted or co-hosted the event twice; they were chosen to accommodate the UEFA Euro 1972 from three candidates,[K] and hosted UEFA Euro 2000 with the Netherlands. Results in chronological order lists all individual matches. Upcoming fixtures are listed on the 2010s results page. As of 24 March 2019[update]. The records are collected based on data from FIFA and RSSSF. As of 7 September 2018[update], the RBFA lists 684 players who appeared on the men's senior national team. [Q] With 110 caps according to the RBFA, Jan Vertonghen has the most appearances for Belgium. [B] Jan Ceulemans started the most matches as captain (48). Hector Goetinck had the longest career as an international footballer: 17 years, 6 months and 10 days. Romelu Lukaku is the highest-scoring Belgium player with 45 goals. [B] Those who scored the most goals in one match are Robert De Veen, Bert De Cleyn and Josip Weber (5); De Veen also holds the record for the most hat-tricks with three. Belgium's fastest goal after the initial kick-off was scored by Christian Benteke, 8.1 seconds into the match against Gibraltar on 10 October 2016. ^ The acronyms KBVB, URBSFA and KBFV come from the organisation's respective Dutch, French and German names: Koninklijke Belgische Voetbalbond, Union Royale Belge des Sociétés de Football-Association and Königliche Belgische Fußballverband. ^ a b c d e f Caps and goals against Romania on 14 November 2012, against Luxembourg on 26 May 2014 and against Czech Republic on 5 June 2017 were counted by RBFA but are not officially recognised by FIFA – the former two due to an excessive number of substitutions according to the Laws of the Game, the latter because the Belgian and Czech football federations were too late in requesting an official match. ^ Even in their last match of 1980, against Cyprus on 21 December, Belgium played in an Adidas outfit. This suggests that Admiral's sponsorship started in 1981, contrary to what the 2014 article stated. ^ The timeline in the 2014 overview article stated the switch from Diadora to Nike happened in 1998. However, the 1999 article focused on this kit sponsor change which took place in mid-1999. ^ The interim managers were Louis Nicolay and Franky Vercauteren. ^ Prime individual awards include being elected the season's or year's best player of a competition; prime team awards equal winning a competition. National top divisions, main national cup competitions, UEFA Champions League and UEFA Europa League are considered. ^ The other bids were from England and Italy, whose teams did not reach the semi-finals. ^ This streak started in September 2016 and does not include the friendly win against Czech Republic on 5 June 2017; this match is not FIFA-recognised since the Belgian and Czech football federations were too late in asking that it would be official. ^ Note that the RBFA does not count caps earned in the Belgian seven Summer Olympics matches, and that it does include Belgium's friendlies on 14 November 2012, 26 May 2014 and 5 June 2017 that are not FIFA-recognised – the former two due to an excessive number of substitutions according to the Laws of the Game, the latter because of a lacking official request. ^ a b c "The RBFA's History". RBFA. Archived from the original on 28 June 2016. Retrieved 9 May 2014. ^ a b "Rules & Governance – Law 3: The number of players". The FA. Archived from the original on 25 October 2014. Retrieved 25 October 2014. ^ a b c "Welles-nietesspel rond oefenmatch tegen Tsjechië: Daarom was het geen officiële wedstrijd" [Yes or no game about friendly against Czech Republic: this is why it was no official match] (in Dutch). Sporza. 6 June 2017. Retrieved 6 June 2017. ^ a b c d e f "The FIFA/Coca-Cola World Ranking". FIFA. 4 April 2019. Retrieved 4 April 2019. ^ a b Elo rankings change compared to one year ago. "World Football Elo Ratings". eloratings.net. 27 March 2019. Retrieved 27 March 2019. ^ Dries Vanysacker (21 May 2015). "Belgische voetbalgeschiedenis begon in Gent" [Belgian football history began in Ghent]. Eos (in Dutch). Archived from the original on 25 June 2016. Retrieved 13 June 2015. ^ François Colin (1 April 2003). "Report. "Kroniek van het Belgisch voetbal" schetst ontstaan populairste sport" [Report. "The chronicle of Belgian football" sketches origins of most popular sport]. De Standaard (in Dutch). Archived from the original on 11 June 2013. Retrieved 29 August 2015. ^ a b c d e Henshaw 1979, p. 75. ^ a b "Historique de l'URBSFA" [History of the RBFA] (in French). RBFA. Archived from the original on 7 May 2012. Retrieved 31 October 2015. ^ a b Fraiponts & Willocx 2003. ^ a b Matty Verkamman (9 January 1999). "Interlandvoetbal om 'koperen dingetje'/Sporteeuw (2) – 1901" [International football for 'the copper thingy'/Sports Century (2) – 1901]. Trouw (in Dutch). Archived from the original on 25 June 2016. Retrieved 9 April 2015. ^ a b c Hubert 1980, p. 12. ^ a b Hubert 1980, p. 13. ^ "Belgium v France − a 109-year-old rivalry". UEFA. 13 August 2013. Archived from the original on 25 June 2016. Retrieved 15 August 2013. ^ "History of FIFA – Foundation". FIFA. Archived from the original on 25 June 2016. Retrieved 16 May 2014. ^ Parrish & Nauright 2014, p. xv. ^ a b Boin 1945. ^ a b Guldemont & Deps 1995, p. 65. ^ a b c Hassanin Mubarak (7 August 2003). "Belgium National Team Coaches". RSSSF. Archived from the original on 29 June 2016. Retrieved 14 September 2013. ^ a b c d e f g h i j k l m n o Karel Stokkermans. "Belgium – List of International Matches". RSSSF. Archived from the original on 1 July 2016. Retrieved 4 February 2018. ^ a b "Frankrijk–België" [France–Belgium]. De Telegraaf (in Dutch). 21 March 1916. Retrieved 11 June 2015 – via Delpher. ^ a b c Juan Fauria í García (1993). "The 1920 Football (Soccer) Tournament" (PDF). ISOH magazine. 1 (4): 5–7. Archived from the original (PDF) on 28 December 2013. Retrieved 4 May 2014. ^ a b c d e Henshaw 1979, p. 76. ^ "Belgium in exile - Belgische regering, vluchtelingen en soldaten in Groot-Brittannië" [Belgium in exile - Belgian government, refugees and soldiers in Great Britain] (PDF) (in Dutch). National Archives of Belgium: 31. Archived from the original (PDF) on 18 December 2016. Retrieved 18 December 2016. ^ Mark Chaplin (5 May 2014). "The birth of UEFA". UEFA. Archived from the original on 25 June 2016. Retrieved 28 June 2014. ^ "België wist Engeland een gelijk spel af te dwingen" [Belgium managed to enforce a draw against England]. Amigoe di Curaçao (in Dutch). 18 June 1954. Retrieved 19 December 2016 – via Delpher. ^ a b c d "World Cup 1954 finals". RSSSF. Archived from the original on 6 March 2016. Retrieved 17 August 2015. ^ "Retro WK 1966: Engeland wint na meest omstreden goal van de eeuw, Duivels stranden in testmatch" [Retro WC 1966: England wins after most controversial goal of the century, Devils left stranded in test match]. voetbalnieuws.be (in Dutch). 31 May 2014. Archived from the original on 25 June 2016. Retrieved 19 August 2015. ^ Bernhart & Houtman 2014. ^ a b c Bart Lagae (23 May 2002). "WK-geschiedenis. 1970. Witte Duivels smelten weg in Mexico" [WC history. 1970. White Devils melt away in Mexico]. De Standaard (in Dutch). Archived from the original on 26 June 2016. Retrieved 26 April 2015. ^ a b c "World Cup 1970 finals". RSSSF. Archived from the original on 1 July 2016. Retrieved 17 August 2015. ^ a b c d Karel Stokkermans; Martín Tabeira (31 January 2007). "European Championship 1972". RSSSF. Archived from the original on 1 July 2016. Retrieved 10 November 2014. ^ "Wonderbaarlijke ontsnappingen uit de Oranje-historie" [Miraculous escapes in Oranje history]. de Volkskrant (in Dutch). 19 November 2003. Archived from the original on 8 June 2016. Retrieved 16 May 2015. ^ Karel Stokkermans; Martín Tabeira (20 June 2013). "European Championship 1976". RSSSF. Archived from the original on 25 June 2016. Retrieved 24 October 2015. ^ Karel Stokkermans; Sergio Henrique Jarreta (3 January 2000). "World Cup 1978 Qualifying". RSSSF. Archived from the original on 25 June 2016. Retrieved 24 October 2015. ^ a b c Karel Stokkermans; Martín Tabeira (28 March 2007). "European Championship 1980". RSSSF. Archived from the original on 1 July 2016. Retrieved 27 August 2015. ^ David Runciman (16 June 2014). "Why You Should (and Should Not) be Excited About Belgium's New Golden Generation". The New Republic. Retrieved 5 May 2015. ^ a b "2014 Fifa World Cup: Guide to Belgium's Group H". BBC. 23 May 2014. Retrieved 12 July 2016. ^ a b c "World Cup 1982 finals". RSSSF. Archived from the original on 1 July 2016. Retrieved 17 August 2015. ^ a b c "World Cup 1994 finals". RSSSF. Archived from the original on 29 June 2016. Retrieved 17 August 2015. ^ a b c d Erlan Manaschev (3 July 2008). 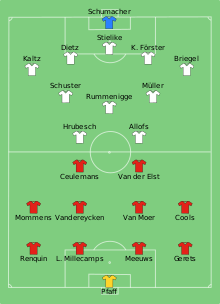 "World Cup 2002 – Match Details". RSSSF. Archived from the original on 1 July 2016. Retrieved 27 August 2015. ^ a b c "FIFA World Cup All-Star Team – Football world Cup All Star Team". Football.sporting99.com. Archived from the original on 30 June 2016. Retrieved 28 June 2012. ^ a b "FIFA World Cups: Awards" (PDF). FIFA. Archived from the original (PDF) on 30 June 2016. Retrieved 19 June 2007. ^ a b "World Cup 1986 finals". RSSSF. Archived from the original on 1 July 2016. Retrieved 27 August 2015. ^ a b Barrie Courtney (19 June 2004). "European Championship 1984 – Final Tournament – Full Details". RSSSF. Archived from the original on 26 November 2001. Retrieved 27 August 2015. ^ a b c John Beuker; Karel Stokkermans (17 January 2004). "European Championship 2000". RSSSF. Archived from the original on 1 July 2016. Retrieved 27 August 2015. ^ Josef Bobrowsky (14 June 2000). "King Hassan II Tournament 1998". RSSSF. Archived from the original on 25 June 2016. Retrieved 20 August 2015. ^ "Cyprus International Tournament 1999". RSSSF. 27 February 2001. Archived from the original on 26 July 2016. Retrieved 26 July 2016. ^ José Luis Pierrend (11 June 2000). "Kirin Cup 1999". RSSSF. Archived from the original on 25 June 2016. Retrieved 20 August 2015. ^ a b c d e f g h i j "All Red Devils". RBFA. Retrieved 14 August 2013. ^ "Markov : "België verzwakt door vertrek Wilmots-Verheyen"" [Markov: "Belgium weakened by departure Wilmots-Verheyen"]. Gazet van Antwerpen (in Dutch). 8 September 2002. Archived from the original on 25 June 2016. Retrieved 27 August 2015. ^ "Waseige resigns as Belgium coach". BreakingNews.ie. 17 June 2002. Archived from the original on 21 November 2015. Retrieved 15 March 2014. ^ a b Maarten Delvaux (6 June 2012). "Overzicht Belgische bondscoaches" [Overview Belgian national team coaches]. Het Nieuwsblad (in Dutch). Archived from the original on 21 July 2016. Retrieved 18 July 2016. ^ Gunther De Vos (18 June 2007). "Sterke generatie schrijft geschiedenis" [Strong generation writes history]. De Standaard (in Dutch). Archived from the original on 25 June 2016. Retrieved 27 August 2015. ^ a b Karel Stokkermans (14 March 2013). "Games of the XXIX. Olympiad – Football Tournament". RSSSF. Archived from the original on 1 July 2016. Retrieved 27 August 2015. ^ Hamdan Saaid (16 July 2009). "Kirin Cup 2009". RSSSF. Archived from the original on 25 June 2016. Retrieved 20 August 2015. ^ Ludo Vandewalle; Gunther De Vos; Ki. V. (3 May 2010). "Georges Leekens dan toch bondscoach" [Georges Leekens national manager after all]. Het Nieuwsblad (in Dutch). Retrieved 10 July 2013. ^ lbo; janm (13 May 2012). "Leekens verlaat Rode Duivels voor Club Brugge" [Leekens leaves Red Devils for Club Brugge]. De Standaard (in Dutch). Retrieved 10 July 2013. ^ Maarten Delvaux; Bart Lagae (15 May 2012). "Marc Wilmots voorlopig interim-bondscoach" [Marc Wilmots provisional interim national manager]. De Standaard (in Dutch). Retrieved 9 July 2013. ^ janm (6 June 2012). "Marc Wilmots is nieuwe bondscoach tot 2014" [Marc Wilmots is new national manager until 2014]. De Standaard (in Dutch). Retrieved 9 July 2013. ^ "Argentina go second, Belgium & Uruguay rise". FIFA. 12 September 2013. Archived from the original on 26 June 2016. Retrieved 12 September 2013. ^ Tim Adams (24 August 2013). "Why Belgium is the hottest country in football". Esquire. Archived from the original on 19 September 2013. Retrieved 15 September 2013. ^ "Rote Teufel: Eine Goldene Generation mit königsblauer Disziplin" [Red Devils: A golden generation with royal blue discipline]. Bild (in German). 11 September 2013. Archived from the original on 26 June 2016. Retrieved 15 September 2013. ^ John Sinnott (10 September 2013). "Will Belgium win the World Cup?". CNN. Archived from the original on 26 June 2016. Retrieved 15 September 2013. ^ Karel Stokkermans; Juan Pablo Andrés; Erik Francisco Lugo (18 June 2015). "World Cup 2014 Qualifying". RSSSF. Archived from the original on 26 June 2016. Retrieved 27 August 2015. ^ a b c Neil Morrison (24 July 2014). "World Cup 2014 – Match Details". RSSSF. Archived from the original on 1 July 2016. Retrieved 27 August 2015. ^ "Belgium stroll past Andorra to qualify". UEFA. 10 October 2015. Archived from the original on 26 June 2016. Retrieved 3 November 2015. ^ "Belgium go top, Chile and Austria soar". FIFA. 5 November 2015. Archived from the original on 26 June 2016. Retrieved 5 November 2015. ^ "Belgium and Turkey claim awards, Hungary return". FIFA. 3 December 2015. Archived from the original on 21 July 2016. Retrieved 21 July 2016. ^ a b "Wales stun Belgium to reach Euro semifinal". ESPN FC. 1 July 2016. Archived from the original on 21 July 2016. Retrieved 2 July 2016. ^ maj (15 July 2016). "Marc Wilmots ontslagen als coach Rode Duivels" [Marc Wilmots dismissed as coach Red Devils]. De Standaard (in Dutch). Archived from the original on 21 July 2016. Retrieved 15 July 2016. ^ "FIFA World Cup qualifying draw format". UEFA. 16 June 2015. Archived from the original on 26 June 2016. Retrieved 21 August 2015. ^ "FIFA/Coca-Cola World Ranking – July 2015 (UEFA)". FIFA. 9 July 2015. Archived from the original on 26 June 2016. Retrieved 9 July 2015. ^ "Greece 1–2 Belgium: Visitors become first European side to qualify for World Cup with win". Sky Sports. 3 September 2017. Archived from the original on 4 September 2017. Retrieved 3 September 2017. ^ Wilson, Scott; Andrews, Kendra; Flaherty, 14 July 2018. "Belgium claims third place at World Cup with a 2-0 win over England". The Washington Post. Retrieved 15 July 2018. ^ "Belgium". Flags of the World. 6 June 2009. Retrieved 3 October 2009. ^ a b c "fifa world cup 1930 group 4". Historical Football Kits. Archived from the original on 8 April 2016. Retrieved 10 July 2016. ^ a b c d e f "Goaaal! Fotomontage Rode Duivels – 1980" [Goaaal! Photo gallery Red Devils – 1980] (in Dutch). Belgian State Archives. Archived from the original on 26 June 2016. Retrieved 20 August 2015. ^ "Goaaal! Fotomontage Rode Duivels" [Goaaal! Photo gallery Red Devils] (in Dutch). Belgian State Archives. Archived from the original on 26 June 2016. Retrieved 20 August 2015. ^ Maarten Delvaux (27 February 2014). "Met deze shirts spelen Rode Duivels op het WK" [Red Devils play at the WC in these shirts]. De Standaard (in Dutch). Archived from the original on 26 June 2016. Retrieved 3 May 2014. ^ "Goaaal! Fotomontage Rode Duivels – 1970" [Goaaal! Photo gallery Red Devils – 1970] (in Dutch). Belgian State Archives. Archived from the original on 26 June 2016. Retrieved 20 August 2015. ^ "Voetbal: Nederland- België 3–0" [Football: The Netherlands-Belgium 3–0] (in Dutch). gahetNA (Genootschap voor het Nationaal Archief, het Nationaal Archief, Spaarnestad Photo). Archived from the original on 26 June 2016. Retrieved 7 November 2014. 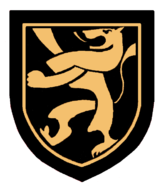 ^ "Heraldic emblem and motto". Belgian Federal Government. Retrieved 31 October 2015. ^ a b "Rode Duivels, witte engelen" [Red Devils, white angels] (in Dutch). BRUZZZ. 5 June 2014. Archived from the original on 21 July 2016. Retrieved 17 July 2016. ^ a b "Den wedstrijd om den Rotterdamsch Nieuwsblad-Beker" [The match for the Rotterdamsch Nieuwsblad Cup]. Rotterdamsch Nieuwsblad (in Dutch). 16 May 1905. Retrieved 17 May 2015 – via Delpher. ^ "New Adidas Belgium 2014–15 Kits Released". Footy Headlines. 14 August 2014. Archived from the original on 26 June 2016. Retrieved 3 April 2015. ^ a b c d e Ludo Vandewalle (24 May 2014). "Adidas na WK wellicht nieuwe kledingsponsor Duivels" [Adidas likely new Devils clothing sponsor after WC]. Het Nieuwsblad (in Dutch). Archived from the original on 26 June 2016. Retrieved 9 May 2015. ^ "1980: België klopt Cyprus met 0–2" [1980: Belgium beats Cyprus 0–2] (in Dutch). Sporza. Archived from the original on 29 October 2016. Retrieved 28 October 2016. ^ Sander Van den Broecke (1 July 1999). "Rode Duivels in "rood, klassiek en rustig" shirt" [Red Devils in "red, classic and serene" shirt]. De Standaard (in Dutch). Archived from the original on 12 November 2013. Retrieved 8 July 2013. ^ "History King Baudouin Stadium". RBFA. Archived from the original on 26 June 2016. Retrieved 9 May 2015. ^ Ludo Vandewalle (4 September 2007). "Duivels trainen voor het eerst in Tubeke" [Devils train for the first time in Tubeke]. De Standaard (in Dutch). Archived from the original on 26 June 2016. Retrieved 18 May 2015. ^ arvn (23 March 2013). "Rode Duivels trainen ontspannen in Neerpede" [Red Devils train relaxed in Neerpede]. Het Nieuwsblad (in Dutch). Retrieved 31 August 2015. ^ vml (31 August 2015). "Bosniërs trainen al eerste keer op Belgische bodem" [Bosnians train first time on Belgian soil already]. De Standaard (in Dutch). Archived from the original on 21 November 2015. Retrieved 31 August 2015. ^ "UEFA Euro 1972 – History – Germany-USSR". UEFA. 3 October 2003. Archived from the original on 26 June 2016. Retrieved 12 August 2015. ^ Pierre Winkler (17 January 2004). "European Championship 2000 – Full Details Final Tournament". RSSSF. Archived from the original on 26 June 2016. Retrieved 12 August 2015. ^ a b c d Karel Stokkermans (6 March 2014). "The "Derby der Lage Landen"". RSSSF. Archived from the original on 29 June 2016. Retrieved 16 May 2014. ^ "België slaat Nederland met 4–1" [Belgium beats Netherlands 4–1]. Algemeen Handelsblad (in Dutch). 15 September 1930. Retrieved 8 September 2015 – via Delpher. ^ Andrew Hussey (3 April 2005). "Lost lives that saved a sport". The Guardian. Retrieved 15 June 2006. ^ Parrish & Nauright 2014, p. xxviii. ^ "Heyzel-stadion wordt gesloopt" [Heyzel stadium to be demolished]. De Telegraaf (in Dutch). 29 November 1988. Retrieved 29 August 2015 – via Delpher. ^ "Stadion – Geschiedenis – Koning Boudewijnstadion" [Stadium – History – King Baudouin Stadium] (in Dutch). Vzw Prosport Brussel. Archived from the original on 26 June 2016. Retrieved 12 August 2015. ^ Geert Sels (25 May 2013). "Koning Boudewijnstadion wordt afgebroken" [King Baudouin Stadium to be demolished]. De Standaard (in Dutch). Retrieved 9 July 2013. ^ "Brussel geeft de doodsteek aan Eurostadion" [Brussels gives deathblow to Eurostadium]. Het Nieuwsblad (in Dutch). 26 March 2018. Archived from the original on 26 March 2018. Retrieved 3 June 2018. ^ "Archiefmeester: Radio & voetbal" [Archive master: Radio & football] (in Dutch). Radio 1. 16 March 2014. Archived from the original on 28 June 2016. Retrieved 13 April 2014. ^ a b c "The World Factbook – Europe – Belgium". Central Intelligence Agency. 30 June 2016. Archived from the original on 10 July 2016. Retrieved 10 July 2016. ^ Joeri Vlemings (5 March 2013). "Rik, de dertiende man van de Rode Duivels" [Rik, the thirteenth man of the Red Devils]. Het Laatste Nieuws (in Dutch). Archived from the original on 28 June 2016. Retrieved 29 May 2014. ^ "Opnieuw gigantisch hoge kijkcijfers voor wedstrijd van Rode Duivels" [Again high viewer numbers for Red Devils match]. Het Nieuwsblad (in Dutch). 27 June 2016. Archived from the original on 27 August 2016. Retrieved 27 August 2016. ^ "Kijkcijferrecord EK Rode Duivels verbroken" [Viewer record Red Devils' EC broken] (in Dutch). VRT. 1 August 2016. Archived from the original on 27 August 2016. Retrieved 27 August 2016. ^ "Nieuwe Vrt-reeks kijkt mee achter de schermen van de Rode Duivels" [New Vrt series watches behind the scenes of the Red Devils]. De Standaard (in Dutch). 3 April 2014. Archived from the original on 28 June 2016. Retrieved 3 April 2014. ^ "Docureeks 'Rode Helden' op Sporting Telenet" [Documentary series 'Red Heroes' on Sporting Telenet] (in Dutch). Telenet. 25 April 2014. Retrieved 17 May 2014. ^ "The Challenges". IAB Community. Archived from the original on 28 June 2016. Retrieved 7 April 2015. ^ "Duiveluitdagingen stuwen Duivels naar Brazilië" [Devil Challenges push Devils to Brazil] (in Dutch). Sporza. 15 October 2013. Archived from the original on 28 June 2016. Retrieved 5 May 2015. ^ a b "Groot succes: 20.000 fans op eerste fandag Rode Duivels" [Great success: 20,000 fans on first fan day Red Devils]. Het Laatste Nieuws (in Dutch). 2 June 2013. Archived from the original on 28 June 2016. Retrieved 30 June 2013. ^ Kim De Raedt; Lin Louage (6 July 2014). "Rode Duivels bedanken 'beste supporters ter wereld' met fandag" [Red Devils thank 'best supporters in the world' with fan day]. De Standaard (in Dutch). Archived from the original on 28 June 2016. Retrieved 6 July 2014. ^ "Dance with the Devils op 17, 22 en 26 juni" [Dance with the Devils on 17, 22 and 26 June] (in Dutch). Sportpaleis. 14 February 2014. Archived from the original on 11 August 2014. Retrieved 5 May 2015. ^ "Dance With The Devils" (in Dutch). Lotto Arena. Archived from the original on 28 June 2016. Retrieved 9 June 2016. ^ "Frankrijk–België (0–1)" [France–Belgium (0–1)]. Twentsch dagblad Tubantia (in Dutch). 21 December 1914. Retrieved 23 July 2016 – via Delpher. ^ a b "Rond den Wedstrijd Holland – België" [About the game Holland – Belgium]. Bataviaasch Nieuwsblad (in Dutch). 3 February 1941. Retrieved 11 June 2015 – via Delpher. ^ Adolfo Garza (22 June 1998). "Bélgica en el alma" [Belgium in the soul]. La Nación (in Spanish). Archived from the original on 21 November 2015. Retrieved 30 August 2015. ^ François Colin (10 June 2011). "Retro. Ceulemans: 'Voor mij blijft EK 80 het hoogtepunt'" [Retro. Ceulemans: 'EC 80 is still the summit for me']. Het Nieuwsblad (in Dutch). Retrieved 21 November 2015. ^ "Bied op de wedstrijdshirts van België-Frankrijk" [Place a bid on the match shirts of Belgium-France] (in Dutch). RBFA. 8 August 2013. Archived from the original on 28 June 2016. Retrieved 15 August 2013. ^ "Goaaal! Voetbalaffiches" [Goaaal! Football posters] (in Dutch). RBFA. Archived from the original on 28 June 2016. Retrieved 14 July 2013. ^ "European Action Week against discrimination in football to kick off next week". Vienna Institute for International Dialogue and Cooperation. 8 October 2010. Archived from the original on 28 June 2016. Retrieved 27 July 2013. ^ Pierre Danvoye (2 July 2013). "Mununga: 'Ik was te naïef'" [Mununga: 'I was too naive']. Sport/Voetbalmagazine (in Dutch). Roeselare: Roularta Media Group. Archived from the original on 28 June 2016. Retrieved 14 August 2013. ^ "Les Diables contre le racisme" [The Devils against racism] (in French). RTBF. 11 October 2010. Archived from the original on 28 June 2016. Retrieved 24 October 2015. ^ vva (27 February 2018). "Rode Duivels strijden mee tegen homofoob geweld" [Red Devils join the fight against homophobic violence]. De Standaard (in Dutch). Archived from the original on 27 February 2018. Retrieved 3 June 2018. ^ "Bob Madou doet duivelse marketingstrategie uit de doeken" [Bob Madou reveals devilish marketing strategy] (in Dutch). voka.be. 17 May 2016. Archived from the original on 28 June 2016. Retrieved 28 June 2016. ^ Russell 1987, p. 129. ^ a b mcu (6 February 2007). "Nieuwe mascotte voor Rode Duivels" [New mascot for Red Devils]. Het Nieuwsblad (in Dutch). Retrieved 3 July 2014. ^ "Fotocollectie – Evenals 74 jaar geleden speelt het Nederlands voetbalelftal a.s. woensdag tegen ..." [Photo collection – Just like 74 years ago the Dutch eleven play upcoming Wednesday against ...] (in Dutch). gahetNA (Genootschap voor het Nationaal Archief, het Nationaal Archief, Spaarnestad Photo). Retrieved 17 July 2016. ^ "VIDEO: Nieuwe mascotte Rode Duivels uitgebroed, het is een... rode duivel" [VIDEO: New mascot Red Devils hatched, it is a ... red devil] (in Dutch). Sporza. 14 March 2018. Archived from the original on 3 June 2018. Retrieved 3 June 2018. ^ "1895, een gigantisch succes" [1895, a gigantic success] (in Dutch). RBFA. 24 June 2013. Archived from the original on 28 June 2016. Retrieved 9 July 2013. ^ "Sport" [Sports]. Rotterdamsch Nieuwsblad (in Dutch). 26 February 1914. Retrieved 8 September 2015 – via Delpher. ^ F. Vranckx (7 June 2013). "Ook koning Albert vanavond naar de Heizel" [King Albert also at the Heysel this evening]. Gazet van Antwerpen (in Dutch). Archived from the original on 28 June 2016. Retrieved 8 September 2015. ^ "Rode Duivels staan op tegen Bosnië-Herzegovina" [Red Devils arise against Bosnia-Herzegovina] (in Dutch). Sporza. 3 September 2015. Archived from the original on 28 June 2016. Retrieved 8 September 2015. ^ "België trakteert zijn helden op een volksfeest" [Belgium treats its heroes with a national feast] (in Dutch). Sporza. 20 June 2011. Archived from the original on 28 June 2016. Retrieved 30 June 2014. ^ Bennie Luyten (18 November 2004). "'Ons voetballand is doodziek'" ['Our footballing nation is terminally ill'] (in Dutch). sport.be.msn.com. Archived from the original on 1 July 2016. Retrieved 18 July 2013. ^ "Advocaat laat Rode Duivels doodziek achter" [Advocaat leaves Red Devils terminally ill]. belgiumsoccer.be (in Dutch). 15 April 2010. Archived from the original on 12 November 2013. Retrieved 18 July 2013. ^ "De enige echte fan van België" [Belgium's only real fan]. Algemeen Dagblad (in Dutch). 5 October 2006. Archived from the original on 28 June 2016. Retrieved 30 June 2013. ^ Ludo Vandewalle (9 September 2009). "De eenzame Duivels-supporter" [The lonesome Devils supporter]. De Standaard (in Dutch). Retrieved 30 June 2013. ^ "De Rode Duivels zien vanavond hun eerste tifo" [The Red Devils see their first tifo tonight] (in Dutch). Sporza. 6 June 2013. Retrieved 4 July 2013. ^ a b Willems 2013. ^ "Peiling: 'Rode Duivels raken tot in kwartfinales'" [Opinion poll: 'Red Devils reach the quarter finals']. voetbalnieuws.be (in Dutch). 17 October 2013. Archived from the original on 28 June 2016. Retrieved 22 November 2015. ^ "Manneken Pis in WK-shirt Rode Duivels" [Manneken Pis in Red Devils WC shirt]. De Standaard (in Dutch). 7 March 2014. Archived from the original on 28 June 2016. Retrieved 22 March 2014. ^ Lin Louage (13 June 2014). "Atomium-bol in zwart, geel en rood" [Atomium sphere in black, yellow and red]. De Standaard (in Dutch). Archived from the original on 28 June 2016. Retrieved 14 June 2014. ^ "Relations to the Netherlands – Belgium". Government of the Netherlands. Retrieved 20 August 2015. ^ "La France et la Belgique" [France and Belgium] (in French). France Diplomatie. Archived from the original on 29 June 2016. Retrieved 22 August 2015. ^ a b c d e "FIFA Tournaments – Compare Teams". FIFA. Archived from the original on 29 June 2016. Retrieved 4 February 2018. ^ "De extra België-Holland-wedstrijd" [The extra Belgium-Holland game.]. Soerabaijasch Handelsblad (in Dutch). 26 April 1932. Retrieved 25 May 2015 – via Delpher. ^ Guus Van Holland (11 December 1999). "De Rode Duivels" [The Red Devils]. NRC Handelsblad (in Dutch). Archived from the original on 29 June 2016. Retrieved 20 August 2015. ^ Karel Stokkermans (6 March 2014). "The "match sympatique" [sic]". RSSSF. Archived from the original on 29 June 2016. Retrieved 28 June 2014. ^ "Geschiedenis van de Rode Duivels" [History of the Red Devils] (in Dutch). Bel 2 Mundial. Archived from the original on 21 July 2016. Retrieved 9 May 2014. ^ W. Verhaert (5 May 2009). "Vercauteren interim-bondscoach Rode Duivels" [Vercauteren caretaker manager Red Devils]. Gazet Van Antwerpen (in Dutch). Archived from the original on 21 July 2016. Retrieved 19 July 2016. ^ "Red Devils Staff". RBFA. Archived from the original on 29 June 2016. Retrieved 25 April 2015. ^ Diederik Geypen (31 August 2016). "Komst van Martinez heeft ook een directe invloed op Courtois, Mignolet en Sels: "Dit wordt een aanpassing voor iedereen"" [Arrival of Martinez also has a direct influence on Courtois, Mignolet and Sels: "This will be an adaptation for everyone"] (in Dutch). voetbalkrant.com. Archived from the original on 9 October 2016. Retrieved 9 October 2016. ^ "Globe Soccer Awards : le triplé pour le Barça, le doublé pour New York City" [Globe Soccer Awards: the triple for Barça, the double for New York City]. L'Équipe (in French). 27 December 2015. Archived from the original on 1 July 2016. Retrieved 27 December 2015. ^ Jamie Rainbow (14 December 2012). "World Soccer Awards – previous winners". World Soccer. Archived from the original on 29 June 2016. Retrieved 29 April 2015. ^ a b "World Cup 1930 finals". RSSSF. Archived from the original on 29 June 2016. Retrieved 17 August 2015. ^ a b "World Cup 1934 finals". RSSSF. Archived from the original on 1 July 2016. Retrieved 27 August 2015. ^ a b "World Cup 1938 finals". RSSSF. Archived from the original on 29 June 2016. Retrieved 17 August 2015. ^ "Cools make it too hot for Spain". The Glasgow Herald. Google News. 16 June 1980. Retrieved 30 June 2014. ^ Jean-Claude Matgen (27 January 2012). "Sinibaldi, le Béjart mauve" [Sinibaldi, the purple Béjart]. La Libre (in French). Archived from the original on 1 July 2016. Retrieved 9 July 2013. ^ a b c "World Cup 1998 finals". RSSSF. Archived from the original on 1 July 2016. Retrieved 17 August 2015. ^ Ludo Vandewalle (5 October 1999). "Behoudsgezinde bondscoach Robert Waseige verandert slechts uit noodzaak" [Conservative national manager Robert Waseige only changes out of necessity] (in Dutch). De Standaard. Archived from the original on 1 July 2016. Retrieved 18 August 2015. ^ Stéphane Vande Velde; Pierre Bilic (8 October 2014). "Marc Wilmots wil sommige Rode Duivels meer vrijheid geven" [Marc Wilmots want to give some Red Devils more freedom]. Sport/Voetbalmagazine (in Dutch). Archived from the original on 29 June 2016. Retrieved 25 August 2015. ^ "Wilmots: "Dominant en intelligent proberen te spelen"" [Wilmots: "Trying to play dominantly and intelligently"] (in Dutch). Sporza. 10 September 2012. Archived from the original on 29 June 2016. Retrieved 18 August 2015. ^ a b "De Bruyne, Witsel en Kompany ontbreken bij Rode Duivels" [No De Bruyne, Witsel and Kompany with Red Devils]. Sporza (in Dutch). 15 March 2019. Retrieved 16 March 2019. ^ Thomas Meunier [@ThomMills] (18 March 2019). "Unfortunately I have to drop out of the Belgian national team selection due to injury. Sorrow and sadness... good luck to my teammates! #WEAREBELGIUM #tousensemble 🇧🇪🇧🇪🇧🇪 #TÔTOUTARD" (Tweet) – via Twitter. ^ "Ook Thomas Meunier en Mousa Dembélé haken af voor interlands" [Thomas Meunier and Mousa Dembélé also drop out]. Sporza (in Dutch). 18 March 2019. Retrieved 18 March 2019. ^ "Martinez: "Veel respect voor wat Rusland getoond heeft op het WK"" [Martinez: "Lots of respect for what Russia showed at the World Cup"]. Sporza (in Dutch). 20 March 2019. Retrieved 20 March 2019. ^ "Martinez: Romelu Lukaku moet ook voor Cyprus afhaken" [Romelu Lukaku drops out for Cyprus match as well]. Sporza (in Dutch). 23 March 2019. Retrieved 23 March 2019. ^ "Belgian Red Devils' squad list for UEFA Euro 2016". RBFA. 12 May 2016. Archived from the original on 30 June 2016. Retrieved 28 June 2016. ^ "Roberto Martínez announces selection". RBFA. 30 September 2016. Retrieved 1 October 2016. ^ rahe (21 May 2018). "Nainggolan stopt als Rode Duivel: "Echt zijn is niet goed voor sommigen"" [Nainggolan stops as Red Devil: "Being real is not enough for some"] (in Dutch). Het Nieuwsblad. Retrieved 3 June 2018. ^ rahe (7 March 2019). "Fellaini stopt als Rode Duivel: "Nieuwe generatie een kans geven"" [Fellaini stops as Red Devil: "Give new generation opportunities"] (in Dutch). sporza.be. Retrieved 7 March 2019. ^ a b c Karel Stokkermans (24 July 2014). "Belgium – Record International Players". Rec.Sport.Soccer Statistics Foundation (RSSSF). Archived from the original on 21 January 2018. Retrieved 6 February 2018. ^ a b "Olympic Football Tournament Antwerp 1920 – Belgium 3:1 (1:0) Spain – Overview". FIFA. Archived from the original on 30 June 2016. Retrieved 26 August 2015. ^ "Olympic Football Tournament Antwerp 1920 – Belgium 2:0 (2:0) Czechoslovakia – Overview". FIFA. Archived from the original on 16 July 2016. Retrieved 16 July 2016. ^ "Raymond Braine nog steeds België's voetbalgrootmeester" [Raymond Braine still Belgium's football grandmaster.]. De Telegraaf (in Dutch). 9 October 1941. Retrieved 13 June 2015 – via Delpher. ^ Murray 1998, p. 63. ^ "Rik Coppens" (in Dutch). 29 April 2010. Retrieved 19 July 2016. ^ a b "Van Himst en Anderlecht kapen de Gouden Schoen" [Van Himst and Anderlecht seize the Golden Shoe] (in Dutch). Sporza. 22 January 2014. Archived from the original on 30 June 2016. Retrieved 26 August 2015. ^ Berend Scholten (21 January 2011). "Belgium still bows to Van Himst". UEFA. Archived from the original on 7 November 2015. Retrieved 3 May 2014. ^ Marcelo Leme de Arruda (21 January 2000). "IFFHS' Players and Keepers of the Century for many countries". RSSSF. Archived from the original on 30 June 2016. Retrieved 14 May 2015. ^ José Luis Pierrend (22 June 2005). "European Footballer of the Year ("Ballon d'Or") 1965". RSSSF. Archived from the original on 16 July 2016. Retrieved 16 July 2016. ^ "Coppens: 'Als Paul zegt dat ik het was, dan heeft hij gelijk'" [Coppens: 'If Paul says it was me, then he is right'] (in Dutch). Sporza. 6 February 2015. Archived from the original on 6 February 2015. Retrieved 11 August 2015. ^ "1972 team of the tournament". UEFA. 2 May 2011. Archived from the original on 30 June 2016. Retrieved 23 January 2015. ^ José Luis Pierrend (1 May 2005). "European Footballer of the Year ("Ballon d'Or") 1980". RSSSF. Archived from the original on 16 July 2016. Retrieved 16 July 2016. ^ "FIFA Classic Player: Scifo, a Red Devil with divine gifts". FIFA. Archived from the original on 30 June 2016. Retrieved 2 May 2015. ^ "Alan Pardew and Vincent Kompany's Premier League award". BBC Sport. 11 May 2012. Retrieved 16 January 2014. ^ "Belgium – V. Kompany". Soccerway. Archived from the original on 6 February 2013. Retrieved 16 July 2016. ^ Nicholas Geeraerts (7 May 2012). "Jan Vertonghen 'Voetballer van het Jaar' in Nederland" [Jan Vertonghen 'Football player of the Year' in the Netherlands]. De Morgen (in Dutch). Archived from the original on 21 July 2016. Retrieved 21 July 2016. ^ "Belgium – J. Vertonghen". Soccerway. Archived from the original on 16 July 2016. Retrieved 16 July 2016. ^ "Mourinho and Hazard scoop Barclays season awards". Premier League. 22 May 2015. Archived from the original on 26 May 2015. Retrieved 26 May 2015. ^ "Belgium – E. Hazard". Soccerway. Archived from the original on 16 July 2016. Retrieved 16 July 2016. ^ "De Bruyne is Speler van het Jaar volgens Duitse Journalisten" [De Bruyne is Player of the Year according to German journalists] (in Dutch). Sporza. 26 July 2015. Archived from the original on 16 July 2016. Retrieved 26 July 2015. ^ "Belgium – K. De Bruyne". Soccerway. Archived from the original on 16 July 2016. Retrieved 16 July 2016. ^ rvh (4 May 2012). "Kevin Mirallas is speler van het jaar in Griekenland" [Kevin Mirallas is player of the year in Greece]. Het Nieuwsblad (in Dutch). Retrieved 19 August 2014. ^ "Belgium – K. Mirallas". Soccerway. Archived from the original on 16 July 2016. Retrieved 16 July 2016. ^ Glen Levy (18 May 2010). "Top 10 World Cup Games – 3. Belgium 4–3 USSR 1986". Time. Archived from the original on 1 July 2016. Retrieved 25 April 2015. ^ vml (21 June 2014). "'Duivelsvloek' houdt al 28 jaar stand tegen Rusland, morgen ook?" ['Devil curse' already lasts for 28 years against Russia, tomorrow as well?]. Het Nieuwsblad (in Dutch). Retrieved 20 September 2015. ^ Edworthy 1997, pp. 138–139. ^ Michaël Van Damme (26 June 2010). "26 juni 1990: de dag dat de goden blind waren" [26 June 1990: the day the gods were blind]. Het Nieuwsblad (in Dutch). Archived from the original on 21 July 2016. Retrieved 19 July 2016. ^ Witzig 2006, p. 167. ^ Fred Buddenberg (4 July 1994). "Belgen furieus op Röthlisberger" [Belgians furious with Röthlisberger]. Trouw (in Dutch). Archived from the original on 1 July 2016. Retrieved 20 September 2015. ^ Witzig 2006, p. 289. ^ Carl Bialik (10 July 2014). "U.S. vs. Belgium Was the Best Match of the World Cup So Far". FiveThirtyEight. Archived from the original on 1 July 2016. Retrieved 25 April 2015. ^ "Official FIFA statistics, updated 5 July 2014" (PDF). FIFA. 5 July 2014. Archived from the original (PDF) on 1 July 2016. Retrieved 29 December 2014. ^ "2014 FIFA World Cup Brazil – Matches – Argentina-Belgium – Live Statistics". FIFA. Archived from the original on 1 July 2016. Retrieved 27 August 2015. ^ Rogers, Martin (6 July 2018). "Brazil's bizarre own-goal gives Belgium the lead". USA Today. Gannett. Retrieved 7 July 2018. ^ Wilson, Jonathan (6 July 2018). "Brazil knocked out of World Cup by Kevin De Bruyne and brilliant Belgium". The Guardian. Guardian News and Media Limited. Retrieved 7 July 2018. ^ Rogers, Martin (6 July 2018). "Belgium fights off Brazil's comeback to reach World Cup semifinals". USA Today. Gannett. Retrieved 7 July 2018. ^ Lisi 2007, p. 47. ^ "Sportflitsen" [Sports flashes]. De Tijd (in Dutch). 14 March 1972. Retrieved 19 September 2015 – via Delpher. ^ "Belgium start with a bang". UEFA. 10 June 2000. Archived from the original on 5 January 2001. Retrieved 30 June 2013. ^ "Belgium ease to 3–0 victory vs. Rep. Ireland". ESPN FC. 18 June 2016. Archived from the original on 14 June 2016. Retrieved 2 July 2016. ^ "Hazard shines as Belgium thrash Hungary". ESPN FC. 26 June 2016. Archived from the original on 21 July 2016. Retrieved 2 July 2016. ^ a b Karel Stokkermans; Mikael Jönsson (26 June 2008). "Games of the VIII. Olympiad – Football Tournament". RSSSF. Archived from the original on 1 July 2016. Retrieved 27 August 2015. ^ Søren Elbech; Karel Stokkermans (21 July 2011). "Games of the II. Olympiad – Football Tournament". RSSSF. Archived from the original on 1 July 2016. Retrieved 27 August 2015. ^ a b "Games per date". RBFA. Archived from the original on 10 May 2012. Retrieved 21 July 2016. ^ "Benteke speeds into the record books". FIFA. 11 October 2016. Archived from the original on 15 October 2016. Retrieved 15 October 2016. Wikimedia Commons has media related to Belgium national association football team.